I was honored to set up a pop-up art shop in the Downtown Bentonville location of Shindig Paperie. As as I explained on social media , every year at this time our community EXPLODES with craft fairs. Art, handmade objects, and all the other fun things (ie. food) that come along with craft fairs. 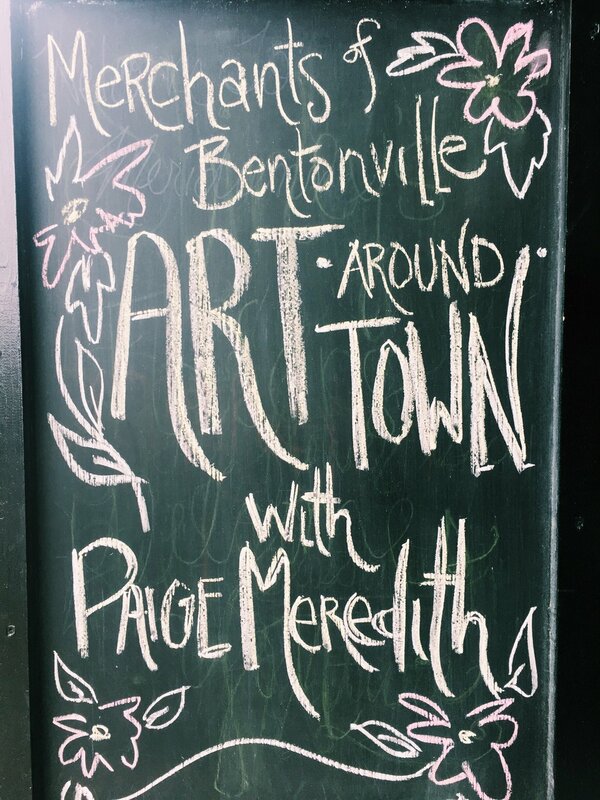 My friend Jaquita Ball got quite a few artists together at retail locations in Downtown Bentonville to do the same- meet people & make art. I realize as I left my house Friday morning that the nerves I get before any event where there. However, they weren't screaming at me. Generally before something in public my inner voice screams at me. "Abort! Abort!! This is NOT a good idea and you will most likely die from mortification if you go through with it." that has yet to be the case. And it was a great event. Here are some shots I grabbed during the event. Paige Meredith is an artist and watercolor illustrator in Northwest Arkansas (Is that "the midwest" or "the south"? no one knows). She's been in love with Shindig's contemporary but feminine aesthetic since it opened a few short years ago. how to begin this post talking about my art installation in Portland at The Cleaners. In part because I feel like I don't know quite where the the story started. So, humor me while I time-travel back about four and a half years ago. I was a grad student working on getting a masters degree in Counseling and things were... fine. I was making the grades and reading the books and writing the papers but I didn't feel like there was a space for my creativity. Sensing the need to have that space I started a blog because it was 2012 and that's what creative people did. I was much too scattered to be a "good blogger" but I loved learning about the online space and community where other people where making and learning and growing. Because of my incessant curiosity (and rural Arkansas insistence on not doing anything half way), I quickly fell into a group of women who were also curious and creative. This last one my husband never really understood. Regardless, that is why, when one of those ladies said last year, "me and a friend are putting on a conference," I said, "I'm there." And when that same friend asked me to display my art at the same conference I (in my typical non-existent self-confidence mode) said, "I'll think about it." Right? The chance to put my work in front of 50 of the brightest, funniest, smartest bloggers and influencers on the West Coast- who says anything but, "yes!" to that? I had so much fear. Fear that my work would never be good or hip or trendy enough. Fear that I embarrass my friend. Fear that I couldn't problem-solve the logistics of moving 20 pieces and a vintage type-writer 2,000 miles. Fear that I couldn't construct an art installation without some sort of "diy post" to refer to. and lots of anxiety I did it because I wanted to be the same sort of friend that Joy had been to me. I wanted to be brave and willing to put myself out there even though failure was a potential option. And it turned out wonderfully. 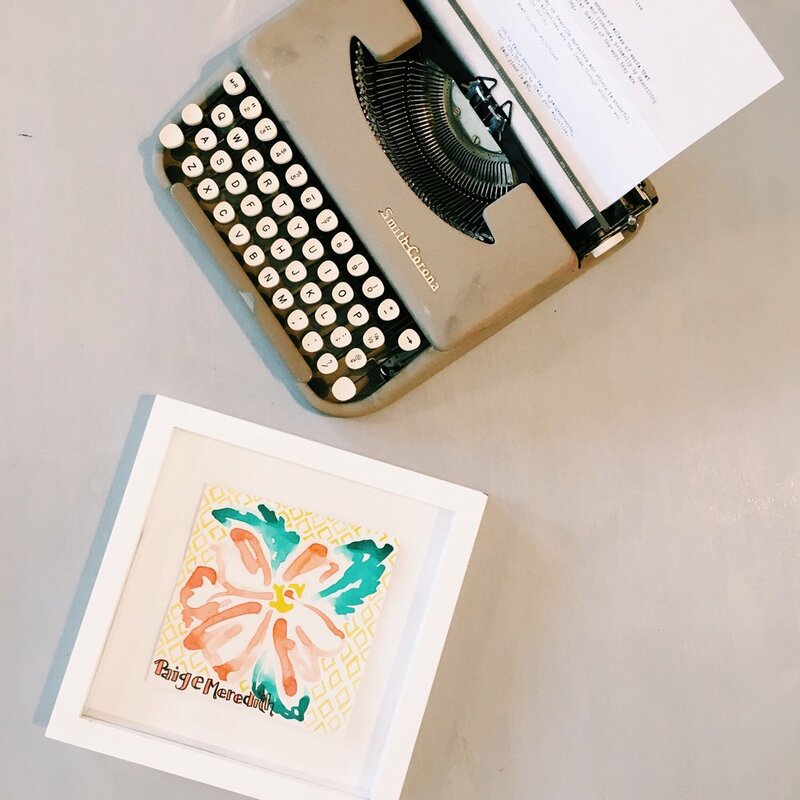 With a little bit of masking tape and countless as trips to the hardware store and my friend Laurie's vintage typewriter and a spark of an idea, I now have art that lives on both coasts. I couldn't be more proud. And grateful for friendship and community that pushes me to be more and better. Ps. I'm working on a post describing this project, which I'm calling, "What is Your Adjective?". Stay tuned to learn more about this series and how you can own an original piece of art as well. Paige Meredith Ray is an artist who resides in northwest Arkansas but who, through some wonderful weird twist of fate, has managed to be in Portland during the autumn for three consecutive years. She recommends you eat at Toro Bravo, Pine Street Market (ramen! And ice cream! ), or Beast. Because food is her preferred way of experiencing a city. This past Sunday I was excited to head to Downtown Springdale and paint at the Rails and Trails Monarch Festival. Ms. Mary of Springdale for Monarchs (a society that is all about preserving Monarch societies so they stay off the endangered species list) invited me to participate in this fun event which had families of all shapes and sizes, a trip through the Ozarks in autumn via train, "monarch seed bombs" (which are dried mud balls full of milkweed seeds), and lots of train-fueled excitement. My small contribution for the event was to paint a butterfly while folks lined up. In addition, I also created three coloring sheets for the kids, because coloring is much more fun than standing in a line and because kids are simultaneously the best artist and storytellers. As with every event I attend, I learned a lot. The major takeaway from this event : Everyone loves coloring sheets - bring lots! Check out the pictures of the fun below and sign up get access to my resource library where you can print it your own coloring sheets. << coming soon. Paige Meredith Ray is a coloring sheet illustrator living in Northwest Arkansas. She has major doubts about the biological accuracy of her butterfly illustrations but she asks you not to blame that on her science teachers. There's something about watching someone paint that is a bit intoxicating. I, like loads of poor country kids who didn't have cable in the early 90's, grew up watching Bob Ross and thinking he was part magician. The fact that he could take a blank canvas and turn it into something beautiful never got old. Which is why, when my friend Amber asked if I would paint at an outdoor event she was helping put together I said, "yes." Because who doesn't like being a magician for an evening? The ladies at the Downtown Springdale Alliance were going for a romantic paris feel and I immediately knew that my large canvases and simple black and white acrylic style would be a perfect fit. The week leading up to the event, I stressed about everything from getting my prints ready to sale at the event to what exactly my subject should be to what I would need to do in case of inclement weather to... you know... the important stuff- What I needed to wear. But most of the stress was the existential maker sort: What if I couldn't find the painter / magician in me while in front of all those people? Could I really pull this off? The day of the event, I gave myself plenty of time to get ready and set-up. The lack of the rush that accompanies my regular day was a nice reprieve and helped me get into a more relaxed state of mind. Overall, I was extremely happy with how everything turned out, with my favorite part being the story below. I would appreciate it if you took a second and clicked on one of the Facebook posts above and "liked" my page. I'm proud to say that my show Local Color is up at The Cafe on Broadway in Siloam Springs, Arkansas. This show is comprised of original watercolor paintings completed in early summer of 2016 which the subject matter, fruits and florals of the season, definitely calls to mind. This was such a great initial art show experience for me (of which I promise I will share in a few weeks) but until then, check out my interview with Lokalen, the amazing local framing company I had the pleasure to work with during this process. To learn more about the individual pieces please visit paigemeredith.com/localcolor. To buy a piece of original artwork please visit paigemeredith.com/shop. The reception will be held Saturday, September 10th from 9-11am. There will be a bottomless pot of coffee and mini-scones provided. I'm am ridiculously excited about the mini-scones part. The work will be up until Sunday, December 11th.